Recently, the Weldon Cooper Center for Public Service at the University of Virginia unveiled a new demographic mapping project, the Racial Dot Map. 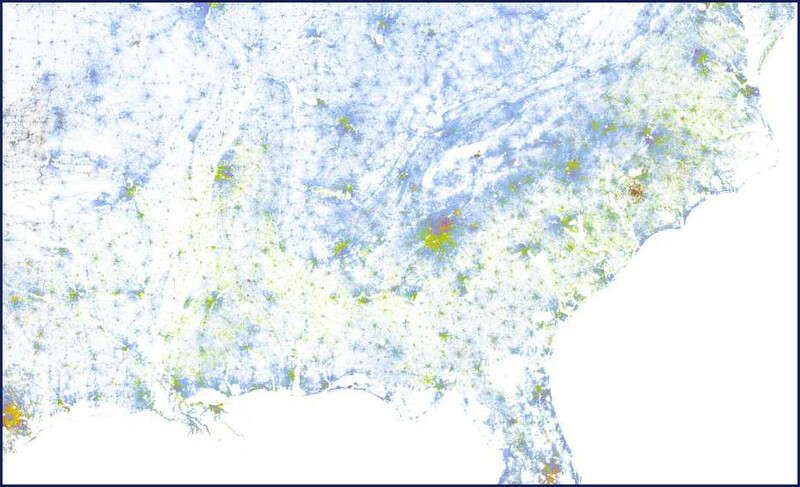 Using the latest 2010 National Census data, the project populated a scalable map with a color coded dot that represents the race of every person living in the United States. The first big push on its viral journey around the web came from the Atlantic’s Cities subsection, where Emily Badger called the map “strangely beautiful.” It is. The map’s primary palette--green for blacks, blue for whites, red for Asians, orange for Hispanics, and brown for others including Native Americans, Pacific Islanders, etc.--provides an interesting combination and separation of colors as one navigates around the country. Drill down close enough for cities to differentiate themselves from each other and the colors begin to separate into blooms. At full zoom individual blocks and neighborhoods become distinct sections of color. The only time these colors bleed is when the population density is so high in metropolitan areas that distinction is impossible, which might sound like a metaphor, but isn’t meant to be. Each dot really is a specific person standing in their home as of 2010. Give or take a few thousand, that’s 308,745,538 points either stranded in the western canvas or piled on top each other in major metros. The South stands out, even unmarked by state borders, as one of the more diverse sections of the country, and we are. But part of the aesthetic value of this map comes from the fact that its colors are tied to density. Regionally, our lower population levels allow the mix of colors to show better against the blank, unpopulated areas--our bayous, our wide forests, our gorges and shale mine sites--like light coming through a bottle tree. This gives the South a pleasantly multicultural appearance as opposed to the string of frontier towns that stretch away from Midwest cities toward the desert or the thick spread of blue that coats the predominantly white central and northeast states where “y’all” morphs into “yinz” and “youse.” The map stands out because we’re used to maps that are equally accurate, but less pleasing to the eye. Of course, as you zoom in to find your own city or hometown, the blue-green overlap dissolves, revealing the not unexpected distinction between black and white (and, in some locations with large migrant and second- or third-generation Hispanic) populations. The races are split into their own enclaves, sometimes quite dramatically as in the case of Birmingham, AL or Baton Rouge, LA. Many newspapers and blogs reacted similarly to Steve Cavendish when he wrote about the map for the Nashville Scene: “Anecdotally, we all know the racial divides of Nashville: North Nashville is black, while the southern part of the county is overwhelmingly white. The southeastern part is Latino and a mix of other ethnic groups.” We know the South has a wide swath of African-Americans, just like we know that our cities are divided if not by choice then by circumstance. We know whites and blacks are much more likely to mingle in public and the workplace than in their living spaces. The purpose of the Census is to compile as much data so that the government doesn’t have to base decisions on vague evidence that “we already know.” While the data can be used for grant-based good or gerrymandering evil, less bureaucratic organizations and demographic analysts compile maps like this one that seem, at first, to creatively confirm our basic beliefs. That is, of course, if you only identify the patterns in the way Southerners for generations have been directly or indirectly trained to do, by looking for the racial divide instead of past it. We are accustomed to thinking of social segregation as the bedrock below our feet instead of a varying terrain. For instance, in Raleigh, NC, the contrast between the colored zones seems to indicate that historical borders between white zones and black ones are still latently respected, if not honored, similar to the 8 Mile Road in Detroit, MI. Though jobs in the Research Triangle have cultivated a truly diverse metro area demographically, new arrivals and second generations are more prone to settle west or north of the downtown and university area. The sprawl continues to expand away from the Long Acre neighborhood and ones similar to it in the east and southeastern areas. By looking merely at the contact point of the colors, though, one might not factor in that only recently has Raleigh started to scale back its preference for clearing land and building new developments that march towards the outlying small towns rather than invest in revitalizing neighborhoods close to the city’s core. Class is much more likely to determine racial diversity in our “successful” cities than history. Racial segregation, of course, is no accident. It was imposed upon cities through a mix of policies and business practices, decades after slavery was outlawed by the constitution [...] Redlining is discriminatory lending. It designated different neighborhoods as relatively good or bad investments. Neighborhoods with white, western European inhabitants got the "A" designation. Black, Latino, Jewish, and Eastern European neighborhoods received lower designations. Of course, if a neighborhood cannot secure financial capital (including mortgages and home improvement loans), it begins to deteriorate physically and socially. Those who can afford to move do so, and take with them social and financial capital. What remains is poverty that is very hard to escape. With some exceptions (e.g. "gentrified" neighborhoods) the mark of redlining remains. (Visit Boyer's blog to see a map comparison between the Cooper map and an old redlining map of Charlotte). Our understanding of neighborhoods different from ours usually relies on traditional attitudes or secondhand knowledge. We’re also prone to extrapolating our loose data onto other cities without keeping in mind their unique methods of expansion, the limitations set on them by geography, and an uneven history of immigration or economic advancement by minorities. There is a little bit of hometown bias as well, whenever we superimpose our knowledge of the ways our home operates onto other places. (That hometown bias skews the map’s default position, as well. If you hit zoom without shifting the screen at the start, you’ll land in Charlottesville, home of the University of Virginia and the Webb Cooper Center). What’s great about this map is that it is the first to provide us with pinpoint accuracy. While density maps have existed before, they were limited to Census tracts and averaged populations out evenly within those tracts. This map is Frame One in a slideshow that will shed light on our segregation’s trajectory throughout the future. It’s fitting, then, that it was captures a time when immigration from places like the Middle East, India and Pakistan reach a tipping point from early adopters to newly established Southerners. The map (and others that will inevitably improve on it) will provide the baseline for future generations of to track and identify patterns more closely, giving race more flexibility as a characteristic. So in ten years from now we will be able to see now races continue to cluster in our New South. We’ll see whether Atlanta will shed its cultural density as its economic growth starts to slow, or if the “white teapot”--New Orleans majority white central areas that revitalized faster due to less damage from Katrina--will continue to push outward or just gain density. We’ll see if Nashville follows through on its potential for becoming an alternate choice for highly-educated immigrants on a large scale. And the changing dynamic way out in the blank, colorless spaces of the map will become apparent as long-term growth becomes less likely in small, rural areas while mid-tier cities gain new citizens. While our emotional responses to race may never be fully diluted by accurate information, if we can provoke curiosity about each point on that map and why they live where they do, we can temper the tendency to color in the lines with common knowledge. Ryan Sparks has been a blue dot for all his life. Follow him on twitter.